I love it when something is so cool that it becomes popular, but then it's too popular so it's not cool any more, but it is now cool to make fun of it. 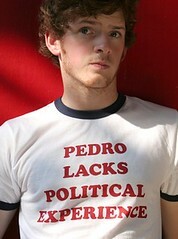 If you don't get it, see Napoleon Dynamite. P.S.S. I used to have a shirt that said "I am Brad Pitt." It was my favourite shirt, and I cried the day it disintegrated in the wash.